This peaceful country home is located 1/2 way between Volcano National Park and Hilo. Hale Ho'aloha is a totally furnished 1 bedroom, 1 bath house on 2 acres. There are two private and separate structures situated on this 2 acre property. The property is landscaped with palm trees, fruit trees and avocado. This one bedroom one bath house features 1296 square feet under roof. This unit is very comfortable and private from the studio that sits behind this house. The relaxation experience is enhanced by a private whirlpool tub and a wooded atmosphere. The bedroom has one comfortable bed with a queen size pillow top mattress and a walk in closet. The living room has a sleeper sofa which turns into a double bed. The dining area consists of a 4 seat dining table and a kitchen bar. The bathroom has a walk in shower and a whirlpool tub. There is a back area for outside BBQ and a front porch. You will find this house very comfortable with all the amenities you need. It is a newer house and the rate is very affordable, allowing you to stay just a little bit longer in Paradise. Come, relax and enjoy. Although this house is close to various vacation spots, it is off the beaten path located in a country atmosphere. 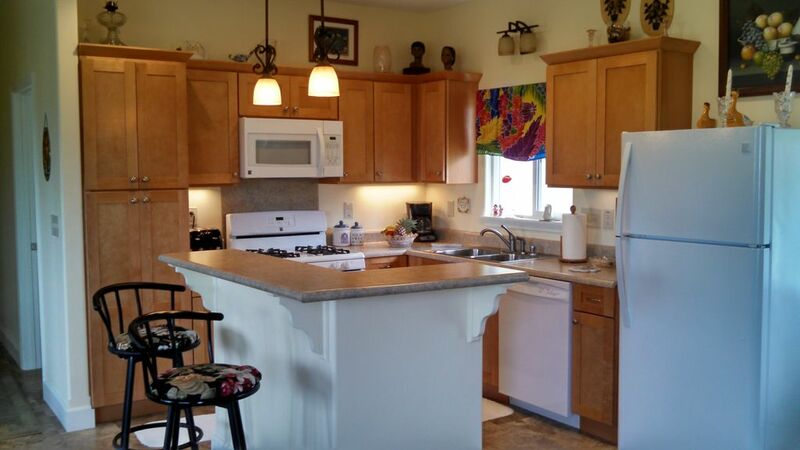 Everything is included; all appliances; including washer / dryer, microwave, dishwasher, dishes, towels etc. Just bring your suitcase. There are many adventures to explore in East Hawaii such as Akaka Falls, Natural Hot Ponds, Rainbow Falls, and there are black and green sand beaches close. I hope you will come and enjoy. The Owner really loves the life stlye the Hawaiian Islands has to offer, it is simple and warm. She has lived on Oahu and in Kona, but She prefers the East side of the Big Island. Swimming, snorkeling off one of the local catamarans and relaxing under a palm tree are just a few things the owner loves to do. When you come here it is time to relax and enjoy the atmosphere. Whether you enjoy going to the beach, golfing, fishing, feasting at a luau, riding a jet ski, scuba diving, sailing, hiking in the Park, flying in a helicopter over an active volcano or just listening to the tropical birds sitting on the lanai; you will be comfortable here. I hope with this affordable rate, and along with all the comforts of home, it will allow you to stay just a few more days. This house is a newer house and well maintained. This property is very comfortable, and is located in Mountain View, Hawaii, 1/2 way between Volcano National Park and Hilo. It is accessible to many activities including Volcano National Park, black, green and white sand beaches, several golf courses, several botanical gardens, several water falls, the Ahalanui Park which is a naturally heated hot pond (heated from the volcano) with warm, calm water and beautiful views of the ocean from the hot pool. The location; Mt. View Hawaii is a little off the beaten path, and the feeling of privacy surrounds you, it gives you that country feel, is very affordable, and has all the comforts of home. Come, relax and enjoy. Free to use. Washing Machine & Dryer. Shared if someone is in the other unit. Free to use. Washing Machine and Dryer Shared if someone is in the other unit. Towels, wash clothes, and dish cloths and towels. Living has a futon and a couch with a HD tv. Direct TV is provided with the house. Perfect "home base" for exploring East side of the island! We stayed at Patty's home for part of our stay to the Big Island. It was a perfect home base for exploring the East side of the island. It's in close proximity to Hilo & Volcanoes National Park. We followed Patty's directions and the house was very easy to find. It's about 4.5 miles off of the main highway. The house has everything you need - a well equipped kitchen, really nice bathroom, Wi-Fi, and so on. The house felt secure and it was private as well. Patty was accommodating and it was clear she wanted us to have an enjoyable, comfortable stay. Definitely recommend! This home was just perfect. The owner supplied everything that we could possibly need (even fresh fruit and chocolates upon arrival). It was impeccably clean and in great shape. We awoke each morning to the cool mountain air, watched the sun come up over the ohia trees, made our breakfast and ate on the lanai. Then we listened to the songs of the birds and thought about whether or not we wanted to get busy or just relax up on the mountain. Some days we went on mini-excursions to Volcano, Hilo, or Pahoa. Other days we listened to Hawaiian music on the dish network and dreamed about what it would be like to live in Hawaii nei. The owner was available if we had a question and even left a notebook to get us started as to how things work in the home and where things are in the area. We couldn't have asked for more! We will no doubt come back to the Plumeria Cottage. Patty goes above and beyond to ensure her guests enjoy their stay. The house and grounds are well kept and beautiful. We wouldn't hesitate to stay again! We throughly enjoyed out stay ! The house was very homey and comfortable, we loved the jetted tub. I would recommend this house for anyone. We were able to visit the volcano national park and all of the south and the east side spots. We went to the punaluu black sand beach and we went up to the top of the mountain to see the observatories. We also went to the waterfalls on the hamakua coast. The house is very private and just about 10 minutes off of the main highway. Excellent! We had an outstanding time. The house was cozy and clean. It was well stocked with all of the conveniences of home. There were plenty of dishes, pots and pans, towels, anything needed to make our trip comfortable. Ms. Summers was an excellent host and was a wealth of information concerning the Big Island. When we had questions, she was more than happy to get back to us with an answer. The house is private yet conveniently located nears stores and Highway 11. It was an easy drive from Hilo airport and we had no problem finding the property. I would highly recommend this property to anyone who wants to enjoy the beauty and serenity of the Big Island of Hawaii. Thank you Ms. Summers for an unforgettable vacation. We certainly plan on returning in the the future. Thank you for taking the time to write a review. I am so glad that you had a excellent vacation. I understand that you were able to visit the entire Island even spending a night in Kona and going to a Luau. I hope that this vacation will be truly memorable for years to come. Although the sights are to numerous to mention. A few of the sights I find interesting are: * Volcano National Park, located in Volcano. *Ahalanui Hot Pond; a natural hot water pond for swimming which is a naturally heated pond and is heated from the volcano's heat, this pond sits at the oceans edge. *The black sand beaches which are located in Punaluu and Hilo. *The numerous waterfalls and tropical gardens are located in Keaau and just outside of Hilo. The Big Island of Hawaii has lots to offer so please come and explore. The rate is for 2 people. $10 extra per person per night over 2 people. Please write for 3 month rental rates. Rates and availability are subject to change until a deposit is made.